Add the magic of Disney Princesses to any room! Giant wall decals featuring a royal castle! So easy - just peel and stick! Every girl's room needs a little Disney magic! 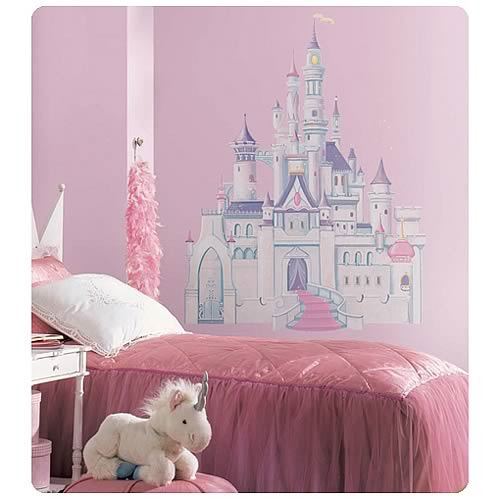 This charming princess castle wall decal is the perfect choice for your own little princess. The decal can be removed or repositioned at any time, and will never leave behind any sticky residue when removed. The castle also features beautiful glitter elements, for a real sparkle that you will be sure to adore! For more magic on your walls, be sure to check out our giant Disney Princess wall decals and Princess Carriage!